A complete Fleet Maintenance package ready to go just for your public works department. 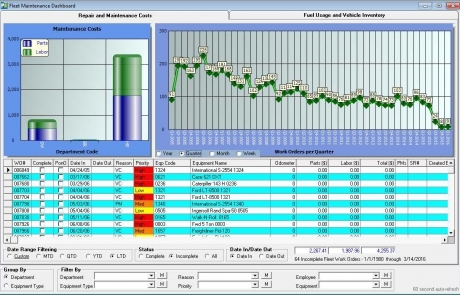 PubWorks Fleet Maintenance module is a complete management software package for any public works department. 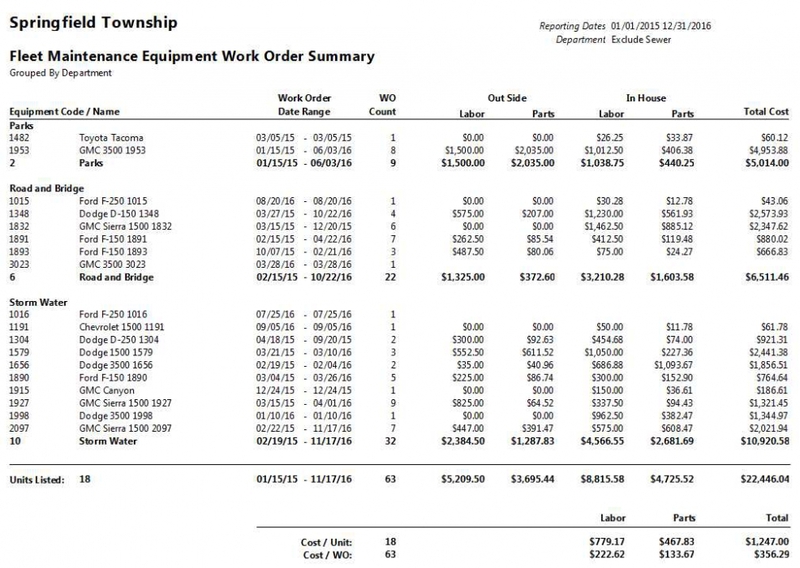 Our Fleet product can either be purchased as a standalone system, or a part of our complete PubWorks Suite. 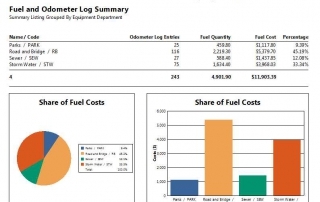 Fleet Maintenance is robust yet easy-to-use and can help you successfully and efficiently manage diversified vehicle and equipment fleets both large and small. 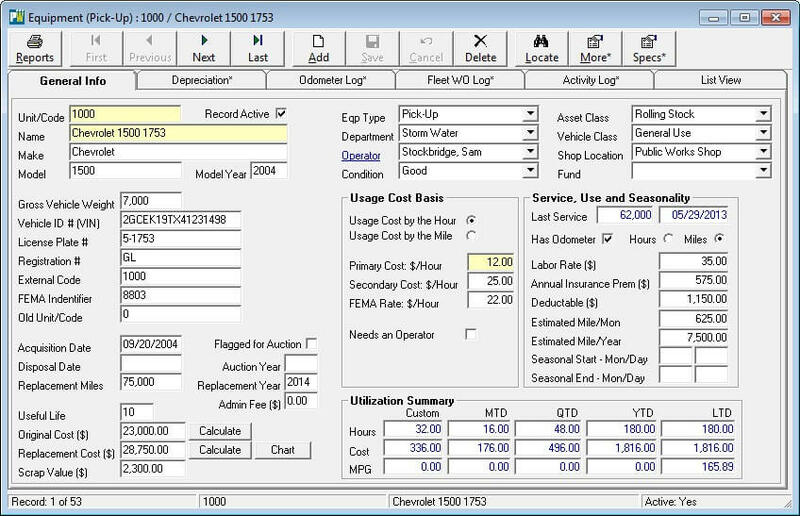 Work Orders record all the work performed on a vehicle including date and odometer readings, labor and parts used and PM items serviced. Notes can be added and can be as detailed and lengthy as you like. 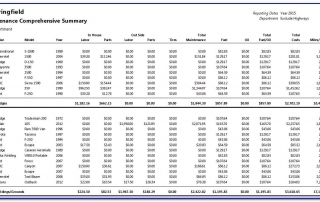 Labor costs are automatically calculated. 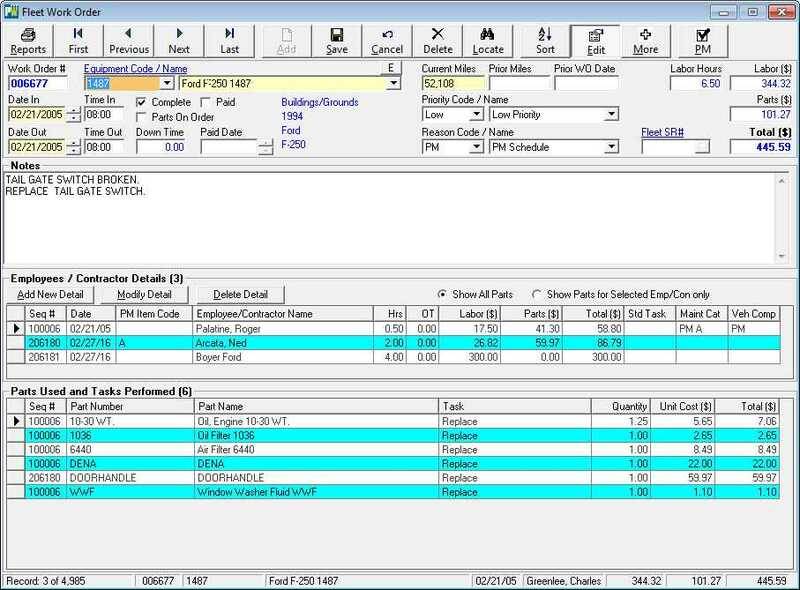 As parts are entered, parts costs are automatically calculated and your inventory is automatically updated. 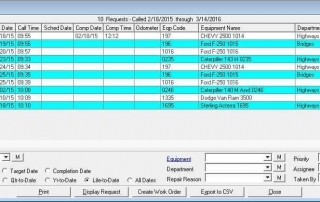 The data entry process for Fleet Work Orders is surprisingly simple given the amount of power and flexibility this feature possesses. 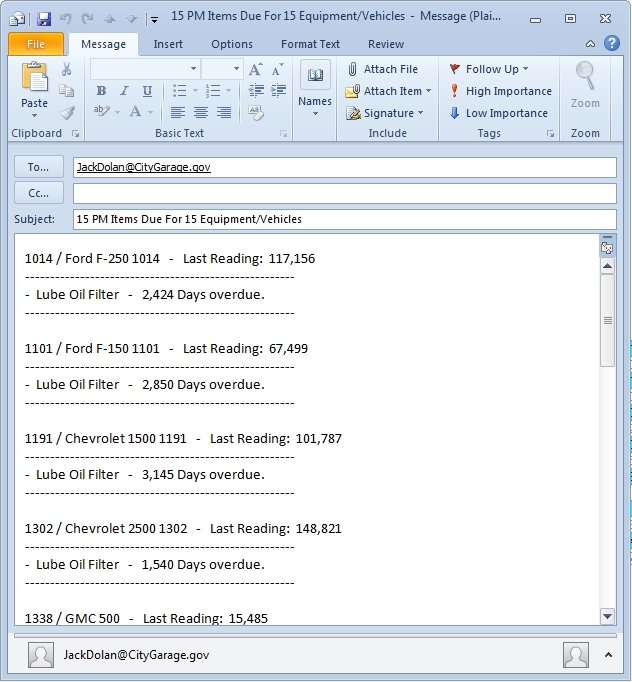 Mechanics can perform the data entry themselves in ways that keep your data safe and secure. Using the PubWorks Preventative Maintenance Schedule allows you to easily exercise a key best management practice. The PM Schedule will keep you well organized and ahead of untimely repairs. 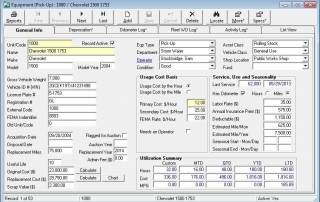 This will save you time, money and keep your shop operating with greater efficiency. 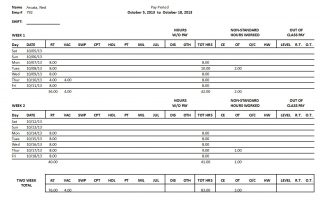 With PubWorks PM Schedule in place, it’s easy to stay on top of what’s due, overdue or upcoming. Everything in PubWorks is customizable. PM Items can be set up for any duration or frequency. For example: Lube Oil and Filter every 3,000 miles, Registration Renewal every two years or a 250 Hour Service for heavy equipment. The combinations are endless. PubWorks provides over 100 ready-to-run reports that are easy to customize with a click of the mouse. 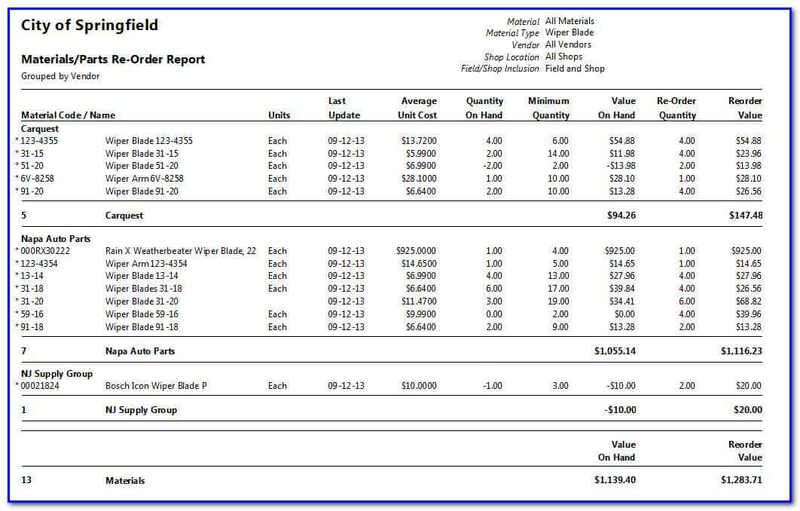 Robust, flexible reporting allows you to analyze the past, manage the present and plan the future of your operation. 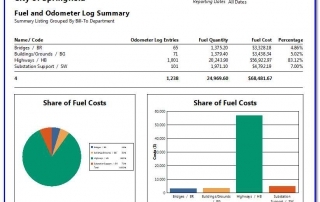 These fleet maintenance report templates are simple enough we’re confident that even the amateur computer operator will have no problem obtaining the important information they need from our fleet maintenance report templates. Transparency – share information easily with colleagues and customers. 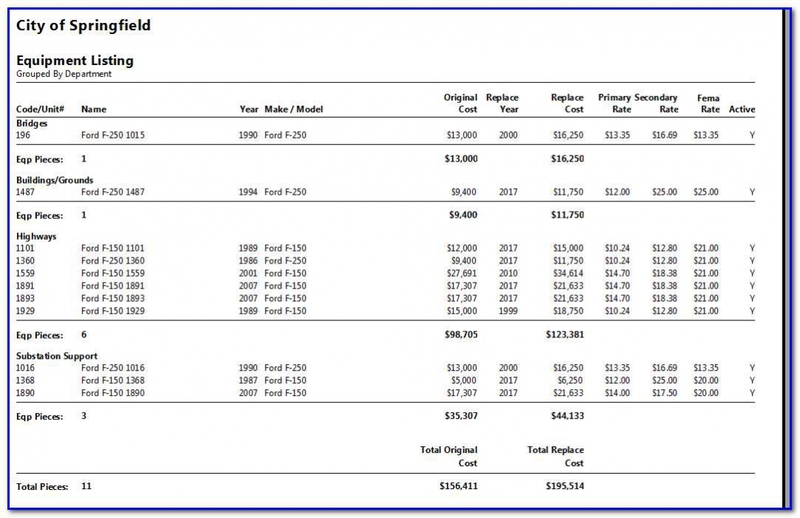 Accountability – know exactly where expenditures on parts, labor and fuel have gone. 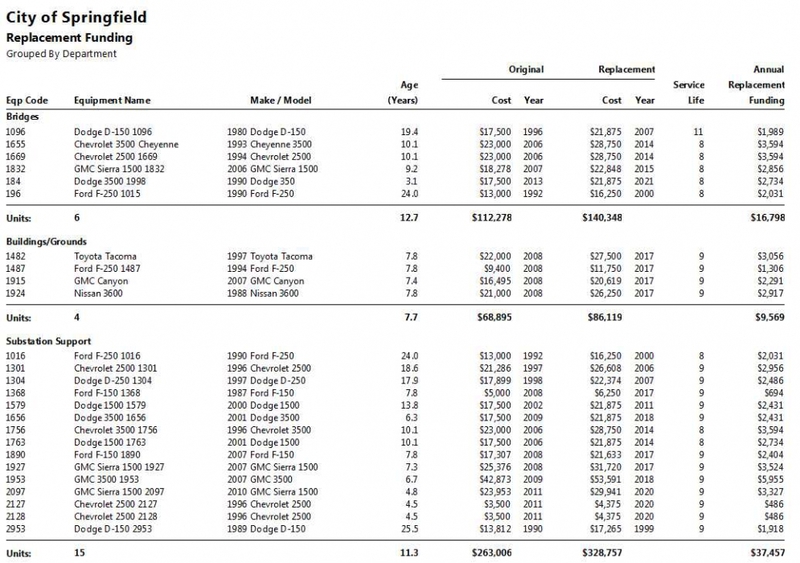 Flexibility – information is readily available in the form of views, reports and graphs. PubWorks Fleet is designed to track work performed by your mechanics and work performed by outside contractors and vendors – it’s fundamental to the design. Internally, your mechanics will be established in the system with hourly cost rates. 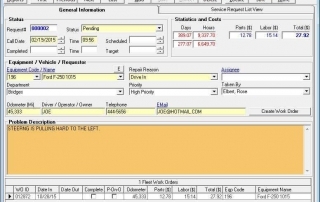 These easy-to-establish and easy-to-adjust rates are typically the fully burdened rates of the cost incurred by your employees. 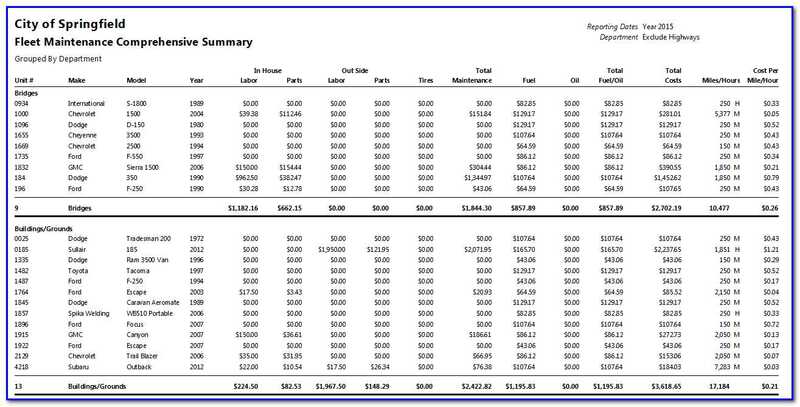 As employees are used on Work Orders, their cost rates are automatically plugged in, and labor costs are automatically calculated. 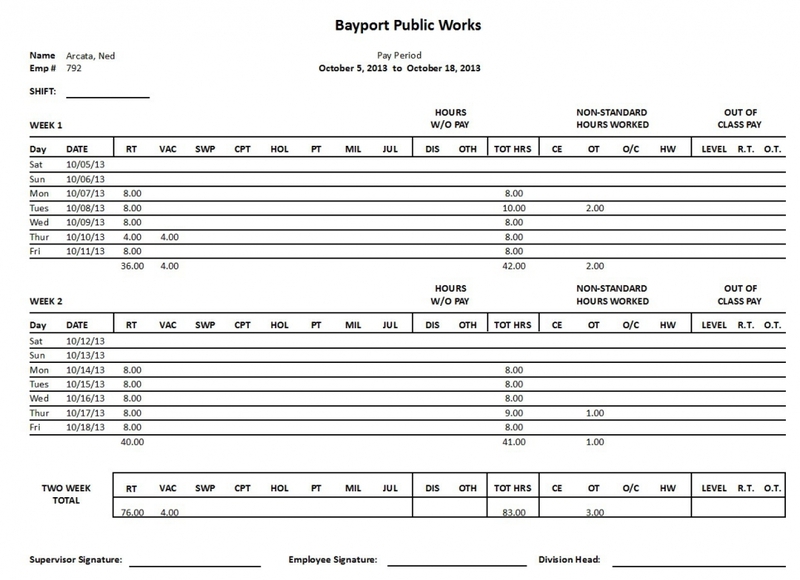 When outside contractors or vendors perform vehicle repairs, PubWorks gives you the flexibility to record their charges for both labor and parts. 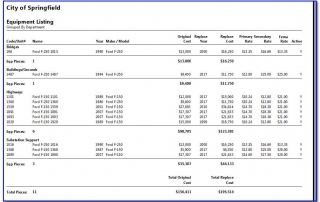 Many of the reports in PubWorks are designed to break out the cost of parts and labor cost for both outside and inside. 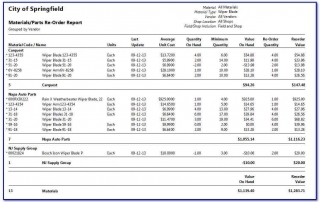 PubWorks integrates with virtually every Fueling System in the marketplace. 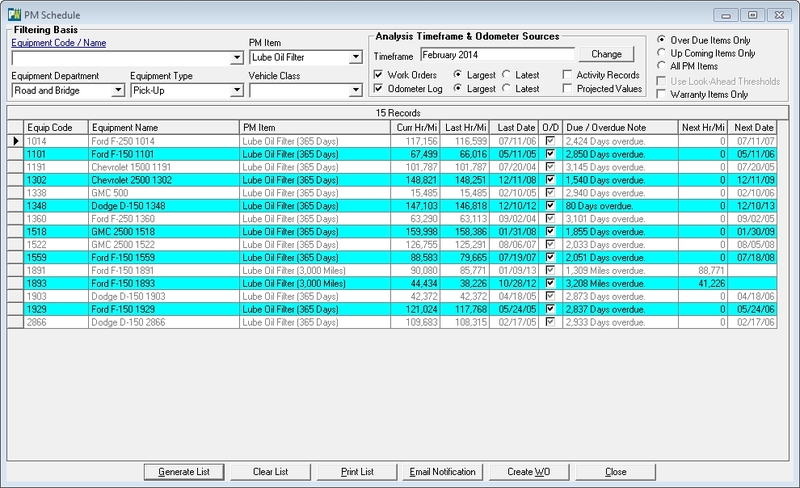 What can I do within PubWorks with my Fueling System data? 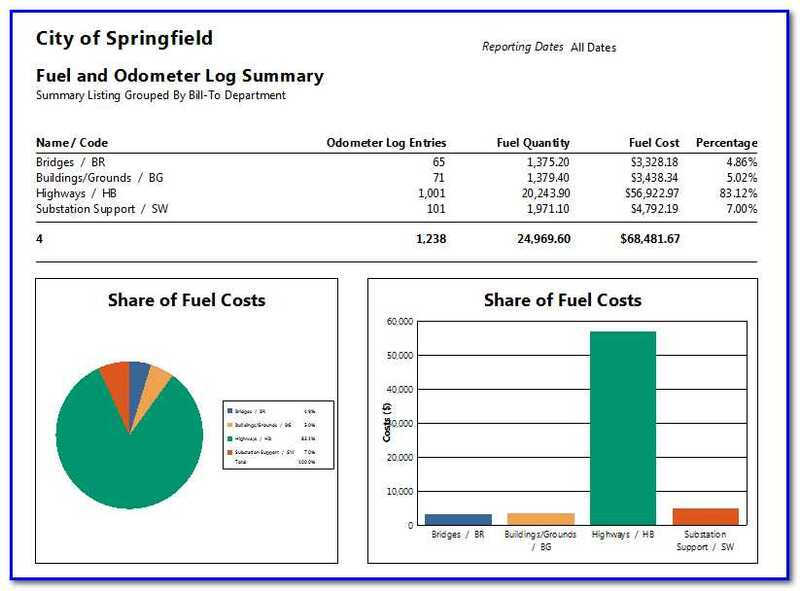 Importing fueling system transactions improves PM scheduling and gives you better control of fuel consumption and enhanced reporting capabilities. 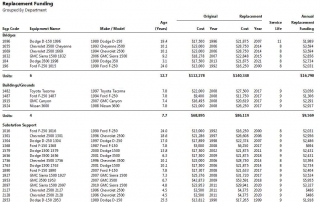 Also, reports for MPG analysis and miles/hours driven over any time-frame. 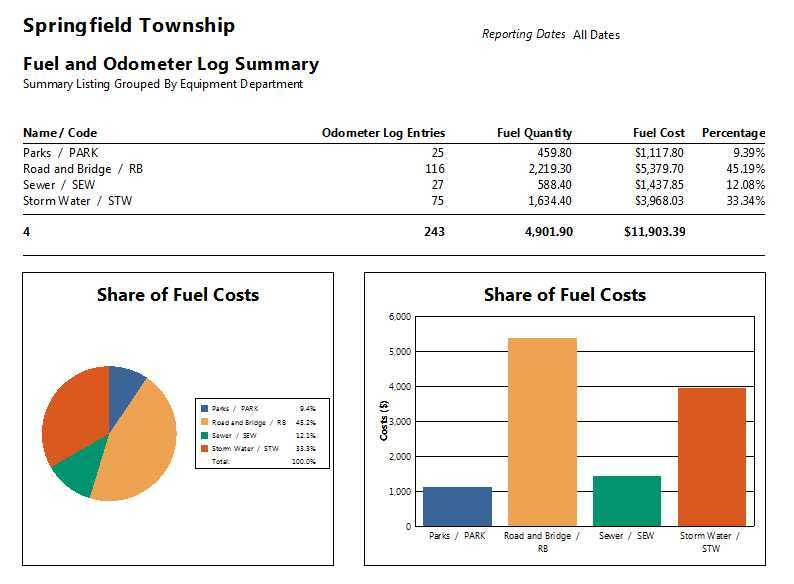 PubWorks can analyze the data imported from your fuel system to give you a summary of fuel used by vehicle, vehicle type or vehicle department. Do you have a lot of repair requests coming from a variety of departments? 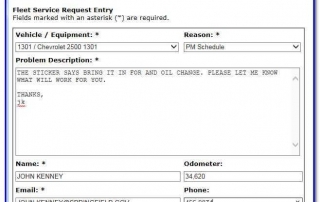 Service Requests is the tool to use to help manage these requests. 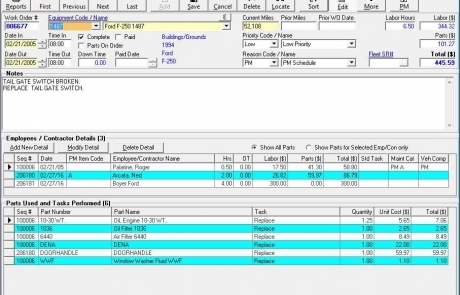 Convert them into work orders with a single mouse-click. 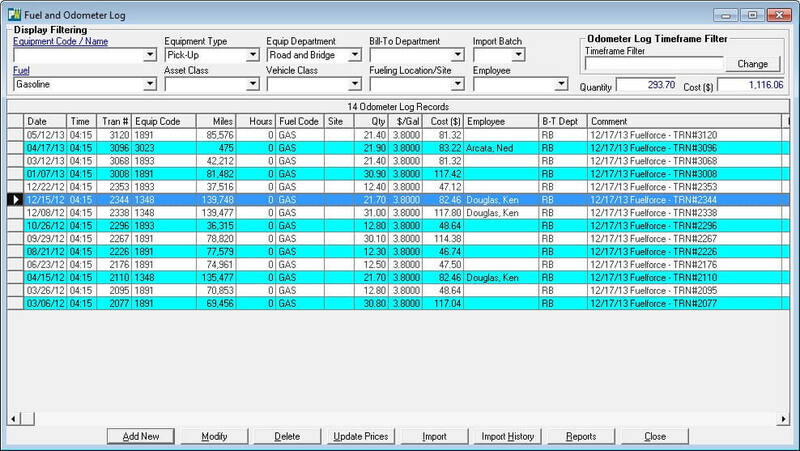 Track them by department, vehicle class or custom fields like “repair reason” or “status”. 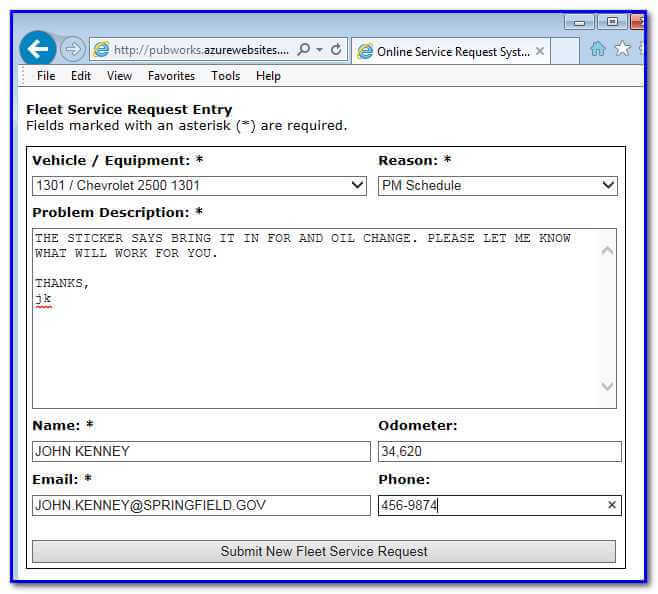 Extend this capability to your intranet site with a web page that allows your customers to submit requests that are automatically inserted into the Fleet Service Request database for your instant access. You have a lot of vehicles and equipment to look after and keep track of. PubWorks can help you organize and manage them. 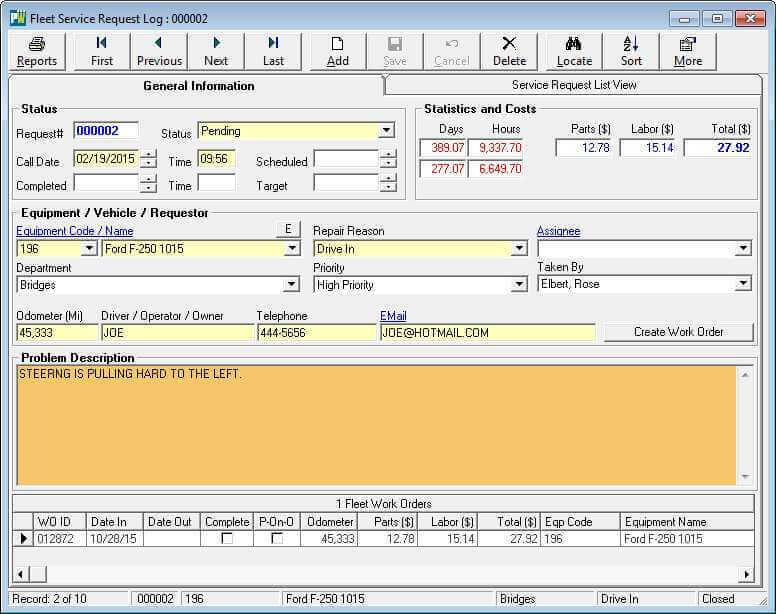 With PubWorks, you can create complete and detailed records of the vehicles and equipment in your fleet. 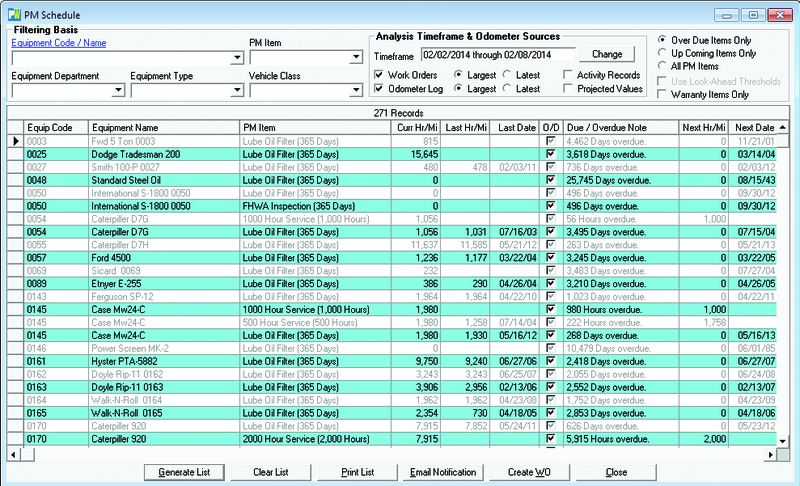 Categorize by department, type, vehicle class and more. Attach documents, photos and PDFs to any and all records. 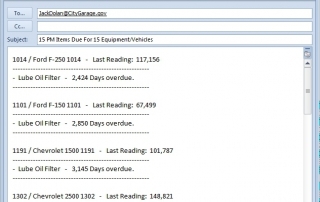 Soon you’ll know what vehicles and equipment you have, the departments they belong to, their maintenance histories, conditions and values. 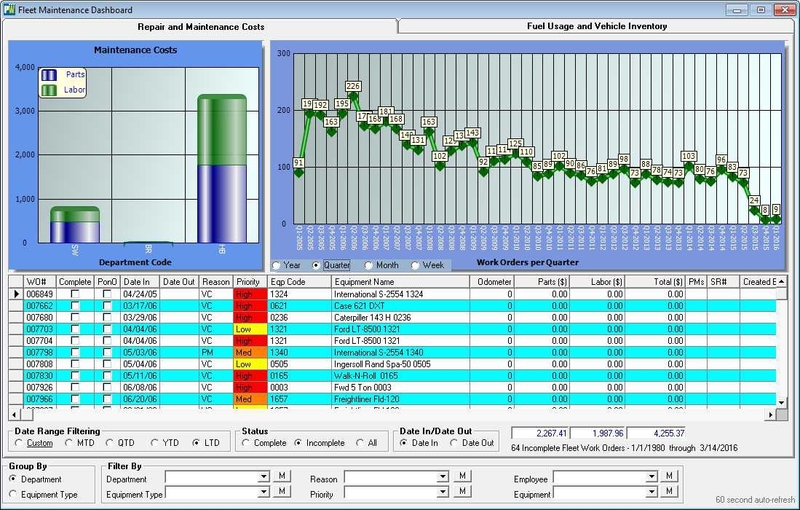 You’ll be able run reports on vehicle replacement, fuel consumption, departmental ownership, the options go on and on! 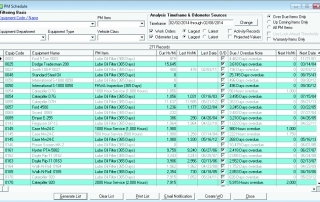 PubWorks helps you manage your parts inventory. 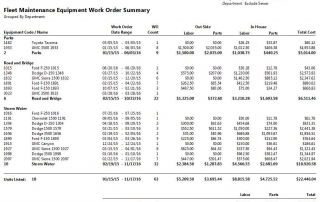 As parts are consumed on Work Orders, their inventory quantities are automatically updated. 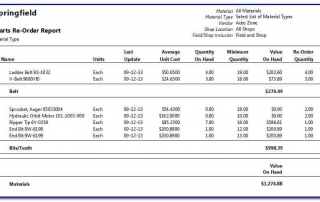 Using minimum and reorder quantities, PubWorks can tell where supplies are low and how much to reorder. 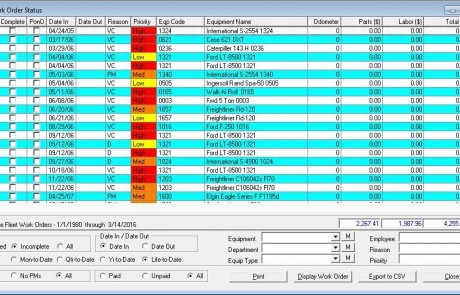 You will always have accurate inventory information at your fingertips and the days of excessive downtime because you’re waiting on parts are over. 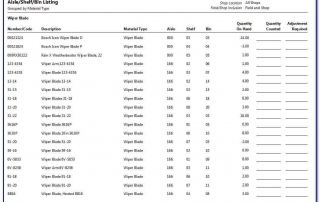 How do I reconcile my parts inventory? 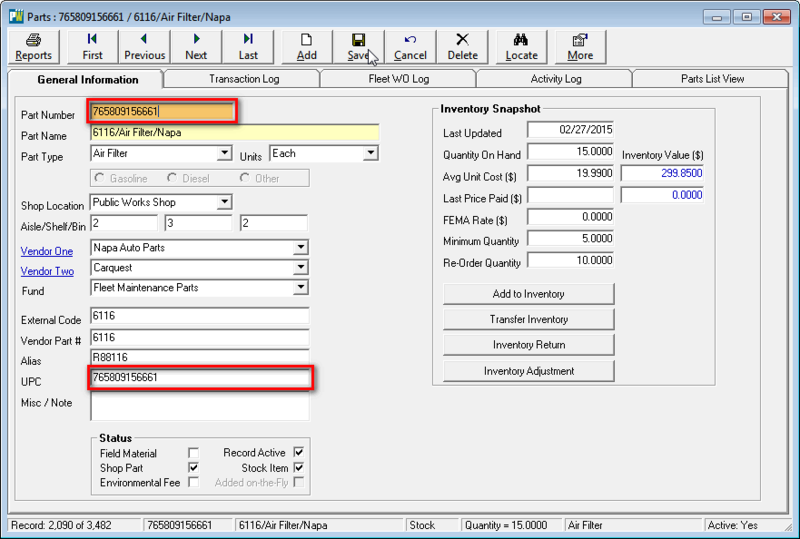 PubWorks has functions for inventory add, return, adjustment and transfer. 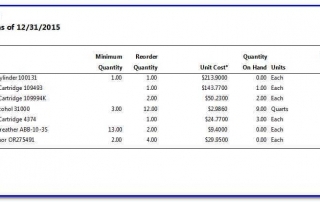 Inventory reconciliation can become a simple as-needed process instead having to perform monthly or annual inventory reviews. This will save time, reduce waste and avoid errors. 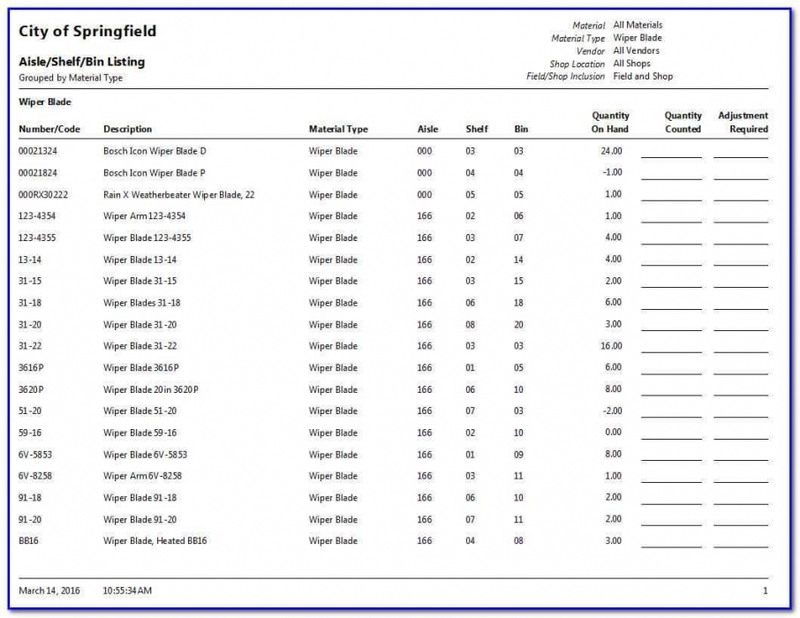 Is the PubWorks Inventory flexible? 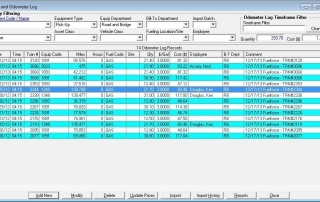 PubWorks allows you to code and categorize your inventory in ways that are best suited for your shop. be stored in multiple shops. be linked to a primary and secondary vendor and an accounting fund. be used to represent environmental and disposal fees. 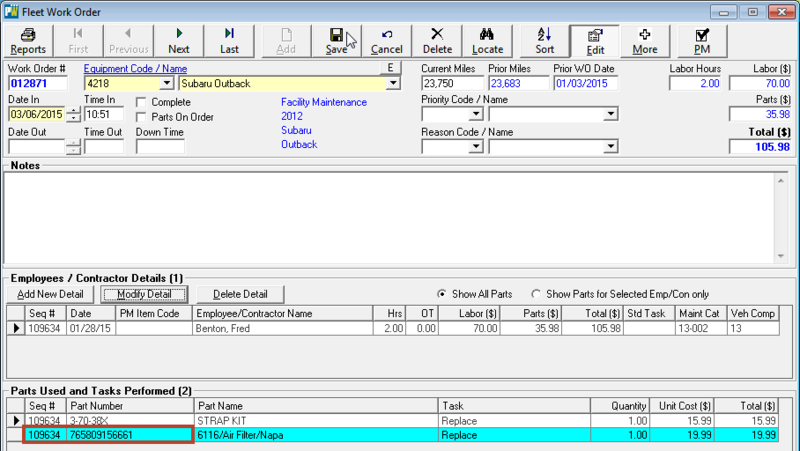 be added “on-the-fly” when introduced via a Work Order. be flagged as stock or non-stock. 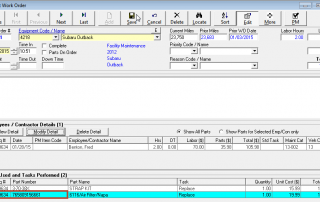 have alias and vendor part number values for alternative identification. 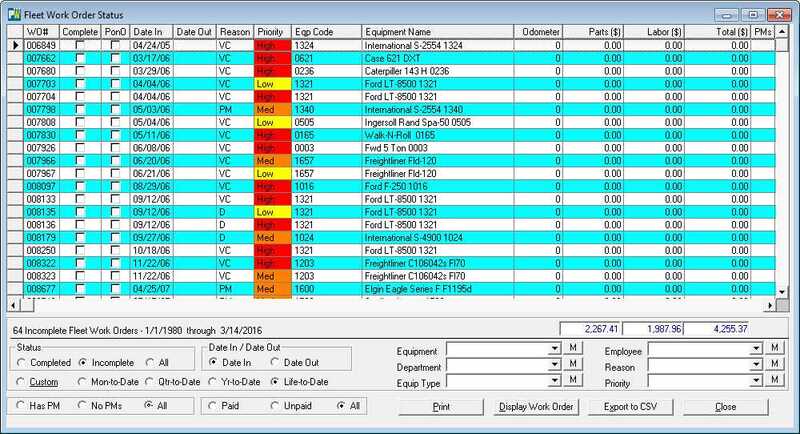 When you scan a parts barcode, PubWorks will translate that bar code into part number and then insert it onto a Fleet Work Order. 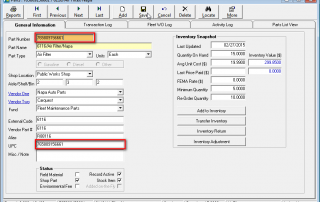 Or, you can search for the part in the inventory, create a new part for your inventory or use the part for an inventory adjustment, return or transfer. Also, printing labels that include bar codes will be handy for bin labeling and better inventory management and control.